Alright, let's renew some items. First, we need to get you into the right account. Do you know where the items are from? To renew books from Bethel, you use your CLICsearch account. Got it! Let's go to CLICsearch. Log In on the CLICsearch screen in the upper right corner. Click on the My Library Card icon. Log In with your Bethel Username and Password. You can request a renewal in ILLiad. It's up to the library who lent the item whether to allow a renewal. Got it. Let's request a renewal. Let's figure out if your item is from a library in the CLICsearch system. Does your book have a barcode label anywhere on it? The item may be from outside our CLICsearch system. These items have extra documentation on them. Does your item have an extra sleeve over the front cover or some extra papers clipped or attached to it somewhere? Ok, looking at the item isn't working. Instead, view your checkout in CLICsearch and/or ILLiad. When you find it, renew it there. You can get PDFs of your requested articles here. Occassionally requested articles come in print form--pick those up at your Bethel Library. This login takes you directly to the page in your account where you can download your requested articles. To renew books from Bethel, you use your CLICserch account. Login to see your checkouts from libraries outside our system. You can also check up on the status of your requests. Basically, you have one account for things in our system, one for things outside our system. CLIC is our system of 6 cooperating universities in the metro. Using CLICsearch is a lot like using a public library with multiple branches. ILLiad is an account for getting things from libraries outside our system. You request it in ILLiad, we find a library that has it. We've put together some of the most used library accounts. Log right in, or get more information about how to use the account. CLICsearch is your Bethel Library account. Login to CLICsearch to see your checked out items, requests, fines, blocks and messages from Bethel and other CLIC libraries. Your interlibrary loan account. This is used for requesting books and articles from libraries across the U.S. and beyond. 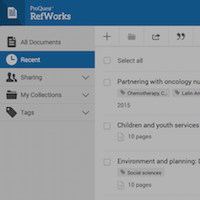 An online citation account where you can save, store, organize, and make bibliographies from your citations.